Gilbert Lenz teaches Agriculture Mechanics Technology at North Valleys High School in Reno, Nevada. His students learn welding, electrical, plumbing, CAD, small engine repair and more as part of his agriculture mechanics coursework. Drawing from his 18 years in the Army National Guard, Mr. Lenz sees leadership development as a key piece of his teaching, and is an advisor to the school’s Future Farmers of America chapter. Chloe Eng is a student in Mr. Lenz’s Level 2 Agriculture Mechanics course. She developed great welding skills and a deep interest in engineering as a freshman, has taken a leadership role as Secretary of her school’s FFA, and is active in the theater program. Combining her two passions, Chloe plans to weld sets for the school’s plays. 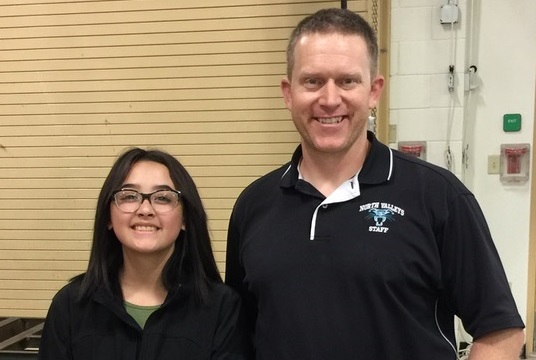 Harbor Freight Salutes Chloe and Mr. Lenz for their commitment to leadership in the trades!